Is your baby having trouble going to sleep during nap time? How about at night? Do you find they are cranky a lot? It's not always colic, one additional culprit is that they are overstimulated. If you have determined they aren't having any tummy issues, this may be your other issue to troubleshoot. 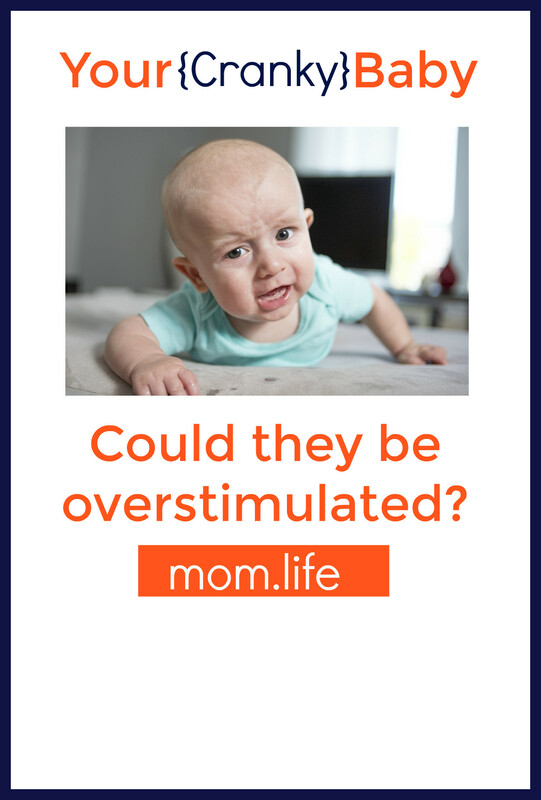 Babies become overstimulated very easily in the earlier months because their brains aren't equipped to take in all of the input from the world around them. As they get older, children can become overwhelmed if they have a busy day where active participation is required. It's something to be aware of, and be in tune with when it comes to your individual child so you can help them through. What this means is, your baby can become overwhelmed easily by a room that is active with noise, being held by several people over the course of a short time, or seeing and being engaged in the busy world around them for an extended period of time. As your child grows this is also true – you may find that they melt down after a big day with friends at the park or if they have a long day at school and then are required to participate in an after school activity. Each child has a different threshhold for stimulation and taking in the world around them, so it's important to tune into what their limits are so you can help them have the quiet time that they need to decompress. What should you do if they become overstimulated? Some great strategies that worked for my kids (and other parents that we know) is to swaddle them up and take them to a quiet space. If I didn't have that option, and we were out and about, I would try to make sure they were in their stroller or carseat and I would close the cover over their sight line so they couldn't see all the activity going on around them. While it didn't shut out sound, it eliminated one of their senses from being overloaded. Another option that worked was a baby carrier – I would use the Moby Wrap to carry around baby. They were snug to my chest where they could listen to my hearbeat and I could often obscure their views and use a gentle shushing sound if the noise around them had become too much. There was something about the shushing noise that was soothing for my kids, versus stimulating. Consider how long you have your baby engaging in their activity time and shorten that time. Tummy time, swing and playmat time are all fun, until it becomes too much. If you notice your baby has a fit during these times, it may not be because they hate that activity, more than they just need it shortened in legnth. As my children became older, we removed them from an activity or situation and offered them quiet time just sitting, and they had frequent naps. They don't always know why they are frustrated or annoyed, but time away from a busy room, ending a busy day or just allowing them some time without having a task to do can diffuse the build up. We're all doing the best we can. If your child becomes overstimulated, just work through it and know that they will be ok. You're doing nothing wrong. It's impossible to keep your child out of every busy scenario. Do your best to keep them in a routine, and tune into what strategies work for them. As they get older, work with them to communicate how they are feeling and to let you know when they are done with their day or an activity so they can help to regulate their own experiences. Looking to connect with moms who understand this mom life? Hop into the mom.life app! Moms are chatting, venting, sharing advice and more. Download it now for free!